I’m getting loads of hits at the moment from searches for ‘David Chipperfield Berlin’ which I guess are all looking for stuff about the Neues Museum. Sorry! The building will open as a museum ‘proper’ in October. My own brief post and images here. The surrounding area is a building site at the moment (an unavoidable side effect of making buildings, I guess) so the pictures lack that archi-pornographic quality: the absence of people, cars and the general mess of urbanity. Chipperfield is rather big with the Germans – he just won Britain’s Stirling Prize for his Museum of Modern Literature in Marbach am Neckar, and his massive project for the re-ordering of Berlin’s Museum Island is currently under construction (across the road from the gallery shown here). b) the British have no time for architects who talk about anything but lettable floor area. The BBC dumped him from the detailed design of their new Glasgow centre, which he claims he won’t step foot in until he gets an apology from the DG. His most notable UK building prior to this was Henley’s very low-key River & Rowing Museum. Not that Berlin’s recent architecture is beyond criticism. The designs by various starchitects* which have filled in great swathes of post-Wall wilderness since the early 1990s (Potsdamerplatz in particular) are, shall we say, not their best work. And since then Berlin seems to be sliding dangerously into a ‘non-critical reconstruction’ of its past, the most notable example being the planned reconstruction of the Royal Palace on the site of the old GDR Palas Der Republik. Presumably the fact that the Germans have no royal family, and cannot agree on what to put in the building, are issues that can be addressed, well, some other time. So it’s good to occasionally see a new building which isn’t in thrall to corporate glazing or historicist pastiche. Chipperfield has an office here in Berlin, by the way. 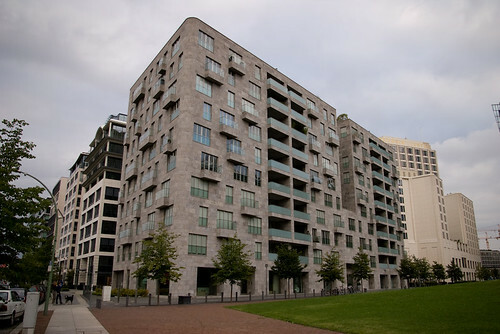 The most notable other completed project is some apartments he did overlooking a small park area round the back of Potsdamerplatz (behind the Sony Centre). I’ve borrowed a couple of images here from Exe on Flickr, hope he doesn’t mind. He’s got a much better one of Am Kupfergraben as well, without clutter. *I hate this term but it seems increasingly apt these days. The pseudo-left attitude to ‘historicism’ is also cliched and patronising. Well I’m sure the reconstructed Royal Palace will be much more up your street… I’ve visited this building and it is beautiful. Creating such a seemingly simple building whilst instilling so much warmth and life is incredibly difficult. Two votes for hideous. 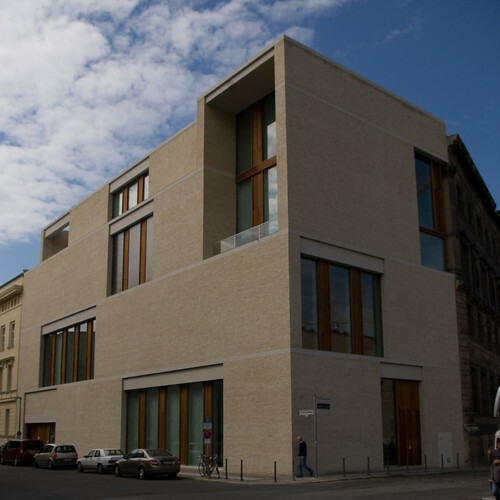 David Chipperfield’s design is just a big tan box with window openings punched arbitrarily across its facade in a predictable, first-year architecture student attempt to enliven it. The only thing beautiful about the building is its new condition, which is all most laymen see. Those who expect a bit more from a modern design, like a masterful play of light and shadow, or sublime geometry and proportion, will find little here. To be blunt, Chipperfield is a pretentious pasticheur of infinitely superior predecessors, particularly Louis Kahn. May the current economic downturn visit his studio first. Wonder what you will all make of what Chipperfield has designed for us in Wakefield, West Yorkshire. I have pictures of The Hepworth Wakefield on my blog, a new major art gallery and museum due to open in September 2010. His building does seem to divide people even before it is completed. The interior spaces are quite magnificent. You obviously haven’t visited it conif de canard. If you had you wouldn’t question his knack for geometry and proportion. The massive interior ceiling heights and spaces they cover are perfectly formed to give this building a reverential atmosphere. Something you notice striaght away when you go in. It somehow forces you to be unusually quite. It doesnt look great, given. But the unconventional brick finish has a great texture that you only notice up close. I have been there and seen it first hand. It’s a stunning piece of architecture, beautifully proportioned, of it’s time yet respecting the historic surroundings. Dunno what school of architecture some of you lot whent to, but clearly quite a crap one.